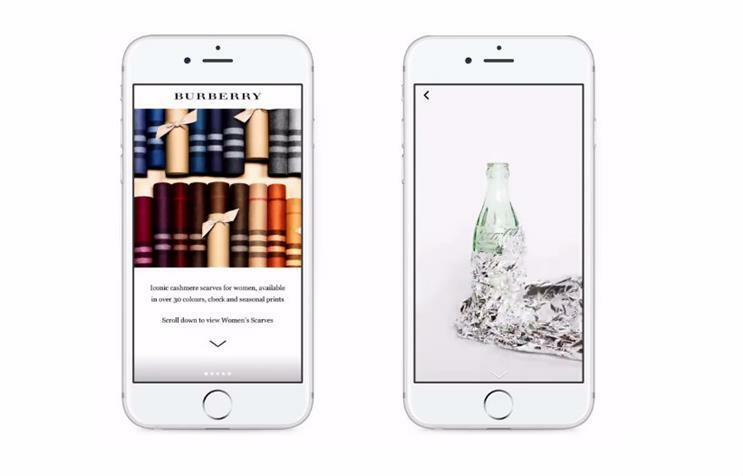 Luxury retailers, car brands and restaurants are among the first brands trialling Canvas, a new, fast-loading mobile ad unit from Facebook. Facebook claims Canvas is its most "immersive" and interactive unit yet. Ad spots created with Canvas appear in a person’s mobile news feed, loading in less than a second. Clicking on the spot turns the ad into a full-screen experience that can feature images, video and interactive elements like tilting to explore a product. Facebook has been testing the new service with around 20 brands in Europe, as well as a larger roster of global brands, including Citroen, Coke, Burberry and Gucci. Burberry's Canvas tests include a version of its Scarf Bar, allowing users to tilt their screen to explore its monogrammed scarves. Coke's Canvas featured a newly launched aluminum bottle, reaching nearly 16m people with an average view time of 18 seconds. Another of Facebook's brand partners, fast-food chain Wendy's, revealed similarly impressive metrics during a press preview. The brand created an interactive spot that deconstructed a Wendy’s hamburger and its ingredients. According to Brendon Rhoten, vice president of advertising at Wendy's, the spot had an average view time of 65 seconds, while 3% of viewers then clicked on to find a Wendy’s restaurant. "Talking about a cheeseburger for over a minute is insanity," he said. "You can’t click to order a Wendy’s cheeseburger – we had people clicking through to find a restaurant, which is very cool." Paresh Rajwat, product lead at Facebook, said that more than half of those who scroll through Canvas units view at least half the ad. Average viewing time was 31 seconds, with the top brands attracting viewers for 70 seconds. Rajwat noted that "that’s a minute spent [watching] because it loads instantaneously". Rob Newlan, regional director for EMEA at Creative Shop, said: "It’s a very interesting playground for luxury brands, as catalogue, or as the pure video brand-building piece as well. "Purposely with that modular system, there’s the ability to get in and scroll through. There’s a ‘tilt’ feature to explore products more." Newlan added that Facebook had worked with apparel, retail and FMCG brands to understand how they might use an immersive ad unit on mobile.